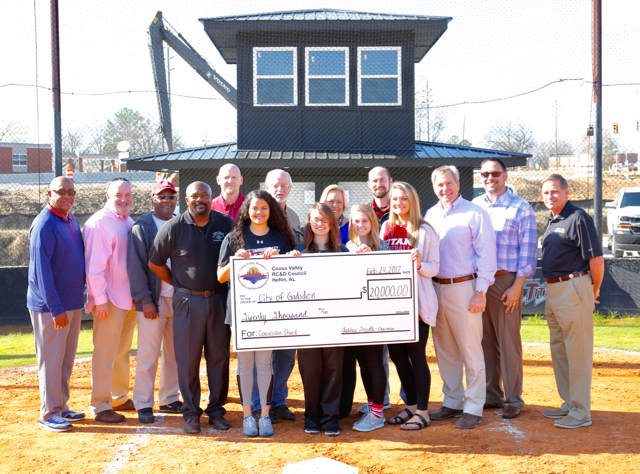 Gadsden, AL- The City of Gadsden recently finished an extensive project building a scoring tower and concession stand at the Gadsden City Titan Girls Softball Field on Black Creek Road. This project wouldn’t have been possible without funding from the Coosa Valley Resource Conservation and Development Council. The Coosa Valley RC& D Council allocated $20,000 to the project. Representative Craig Ford was instrumental in allocating the funding for the project. With the support of Senator Williams, Representative Ford gave an additional $10,000 to the project through the Etowah County Community Development fund, with Representative Becky Nordgren giving another $5,000 from that same fund. The new concession stand and scoring tower will greatly improve the experience for teams using the softball field. The Gadsden City High School Titan Girls Softball team uses this field as their home ballpark and City of Gadsden hosted tournaments make use of this facility as one of the best softball fields in the area. The scoring tower will offer improvements including space for officials, media, coaches and scorekeepers, while the concession stand will offer fundraising opportunities for team supporters and refreshments for spectators. The project was executed by the City of Gadsden. Labor to build the facility was provided by City of Gadsden Facilities Maintenance crews. We know that players, coaches and fans will enjoy the upgraded facility, and we encourage you to support our local student-athletes by stopping by a game at the City of Gadsden Softball field on Black Creek Road or at the Gadsden Softball Complex.